Traditional Sesame Butter. Used in sauces, dressings and spreads. The primary ingredient in hummus. TAHINI is a `nut-butter’ made from Sesame Seeds. It is a favourite in the Middle East and is used in traditional dishes, cookies, cakes, sweets and spreads. 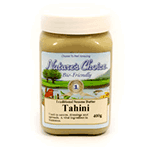 TAHINI combines excellently with garlic, lemon juice, soya sauce, barley malt syrup, yoghurt, honey, buttermilk, orange juice and fresh herbs to form a variety of dressings and sauces.